First up is the annual meeting of the Society for the Study of Amphibians and Reptiles (SSAR) in Lawrence, KS from July 30th through August 2nd. Tracy, Chris Howey, Mark Herr, and I will all be roadtripping it out there and back with one day, 15 hour drives each way….paaaaaarty! The meeting will feature lots of cool herp-related symposia and talks, as well as live animal shows, a herpetological quiz, a silent auction, closing picnic, and field trips to Kansas herp sites as well as awesome presentations by the folks in our lab, of course. Mark Herr will be presenting in the Seibert-Ecology section (he won a special undergrad honorable mention last year and is back for a chance at more glory this summer!) He’ll be showing that fence lizards actually develop a taste for fire ants once they’ve experienced them. We’ve found that this effect occurs consistently over multiple time scales, including within a lifetime and across generations. Mark will be warming up the conference, taking the stage at 1:45 on Friday in the Jayhawk room. 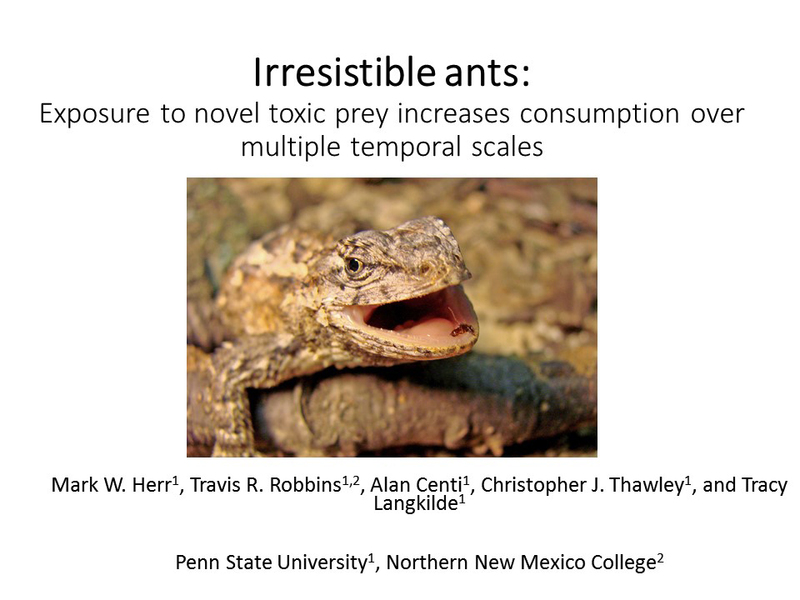 I’ll be discussing how invasive fire ants have reversed geographical patterns in many aspects of fence lizard ecology, including their behavior, stress responses, and morphology, across their range in less than 75 years. I’ll be kickin’ it live on the final afternoon of the conference, August 2nd at 2:30 in the Alderson Auditorium. I’ll also be warming the stage for Rick Shine, eminent Australian herpetologist, Tracy’s former advisor, and future prez of SSAR, who’s come all the way from the Land Down Under just to attend this conference. 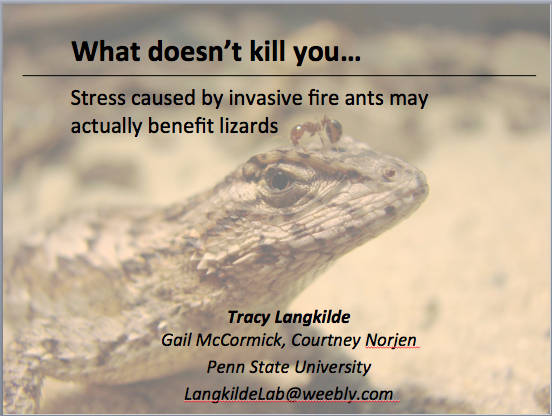 Tracy will be talking about her research testing the effects of fire ant-induced stress on antipredator behavior, immune function, and offspring fitness of native lizards. 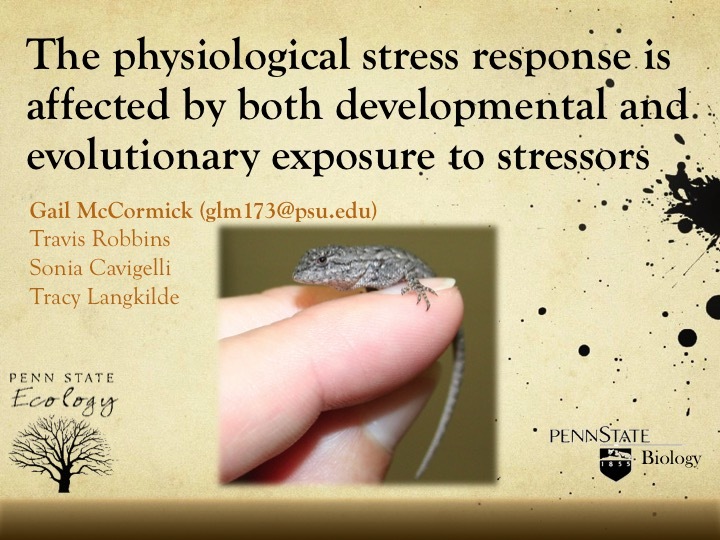 Our results reveal an adaptive role of the stress response for surviving environmental threats. She’ll knock ’em dead after Rick at 3:30 in the Alderson Auditorium on Sunday. 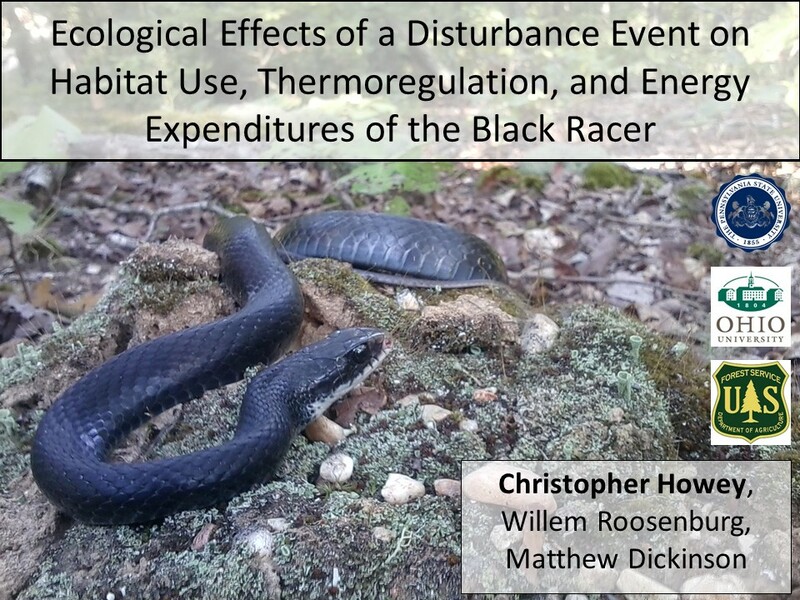 and Chris Howey will be giving a poster on “Thermal preference, performance, and kinematics of the black racer” (no preview for this one, you’ll have to see it in person!) at the poster session on Saturday. Drop by and see us if you’re at the conference! Just a week after returning from SSAR, we’ll also be attending the annual meeting of the Ecological Society of America (ESA) in Baltimore, MD from August 9th-14th. This is the centenary meeting of the society, so it is apparently going to be huge (maybe 5,000 people!?!). Perhaps a little intimidating, but there should be no shortage of awesome science on display. Gail, Chris, and I will all be headed down and giving talks. 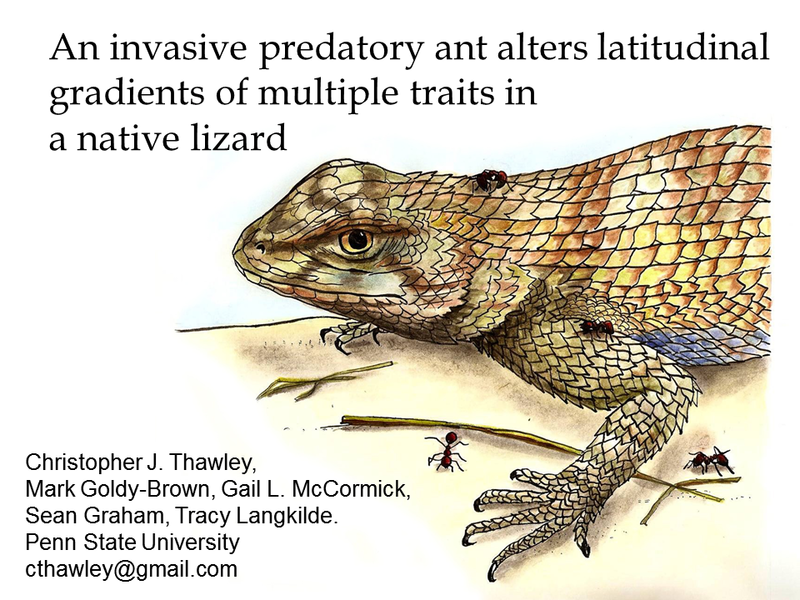 I’ll be giving a very similar talk to that at SSAR (see above), but elaborating a little more on how invasive species can alter patterns in many traits over large spatial scales. So if you get the chance, drop by to hear it at 2:30 on Tuesday the 11th in Room 329! Chris will be presenting on how a specific disturbance, prescribed fire, changes how black racers interact with their environment and leads to increases in energy expenditures. However, racers in the disturbed habitat are able to balance these energy losses by increasing the amount of time they are active on the surface and the amount of food they consume. Chris will be on stage at 4:00 on Tuesday the 11th in Room 323. Categories: Articles and Presentations | Tags: conference, ecological society of america, ecology, herpetology, SSAR | Permalink.